:Jesus called his followers first and foremost to become disciples. Sadly a great many of those who have made a profession of faith fall by the wayside and never become true disciples, because they have never been carefully nurtured. This short course by evangelist Michael Green is designed to help people move from decision to discipleship. Used across four continents, it is a wonderfully effective resource that works for both small groups and individuals. This book will guide those who have recently come to faith and those seeking faith in how to become a disciple of Jesus. It will point the way to fruitfulness and life! 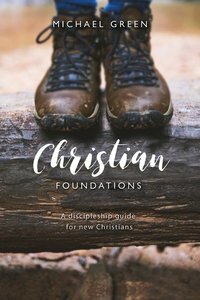 About "Christian Foundations: A Discipleship Guide For New Christians"